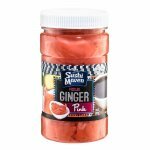 Red Masago 2.2lb [REDMASAG2] - $50.00 : SushiMaven.com, Your Source For Everything Sushi! THIS ITEM MUST SHIP OVERNIGHT. PLEASE MAKE SURE TO SELECT ONLY THE OVERNIGHT SHIPPING METHOD DURING CHECKOUT. Masago is fish eggs from the smelt fish. It is a really small beadlike roe with a sweet mild flavor that bursts in your mouth . Masago is popularly used to top sushi and sashimi dishes because of its bright color and mild flavor. When you add masago, you take a ordinary dish and bring it to the next level! 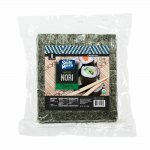 Sushi Maven Toasted Mixed Sesame Seeds 1lb.